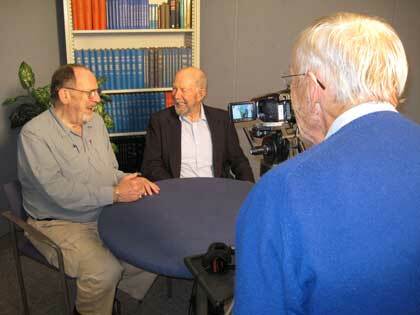 Retirees volunteer for many tasks, including participation the the UCDEA Video Records Project. Many UC Davis departments rely on the services of volunteers. Whether your interests lie in the care and support of people, animals, or plants, you can find a department that will welcome your assistance. If you do not live in the Davis or Sacramento areas, you are encouraged to seek out volunteer opportunities in your area—you and your community will reap the rewards. Retirees will find ample opportunities to serve the university in a volunteer capacity. Whether your interests lie in the care and support of people, animals, or plants, you can find a department that will welcome your assistance. More than 50 volunteers serve the Retiree Center by planning and implementing programs, assisting with administrative tasks, attending outreach events, and overseeing special projects. If you are interested in volunteering for the Center, please contact the Center us for more details. The UCDRA and the UCDEA are both all-volunteer organizations, independent from, but closely aligned with, the university. These two associations play an important advocacy role for all retired faculty and staff, both at the campus and statewide level. The associations sponsor quarterly membership meetings and monthly talks for members. In addition, the UCDEA coordinates the Video Records Project, which creates historical DVD’s of interviews with emeriti and campus administrators. The UCDEA and UCDRA are both volunteer organizations. If you are interested in volunteering for a committee or serving as a board member, visit their websites for more information. Volunteer docents help visitors to have an enjoyable educational experience through which they will learn about Lake Tahoe and environmental problems affecting it. After completing a docent training program, volunteers can select from a variety of tasks, including assisting visitors with hands-on science activities, explaining to visitors the various exhibits, leading tours, assisting in outreach programs for schools and community events, and working in the docent office, assisting with filing, typing, mailings, phone and e-mail correspondence. TERC.. Volunteers assist the UC Davis Health System in its mission of education, research and public service. These programs add the extra dimension of sensitivity, support, friendliness and service that ease and brighten a patient's hospital stay or clinic visit.